Andre the Giant is a documentary co-produced by WWE. So a chunk of the documentary is spent on how Vince McMahon sr & jr built up their wrestling empire from the north eastern territory to a national wrestling organisation, gobbling up smaller rivals and joining up with the emerging cable television stations. Andre Roussimoff takes a back seat in his own film. Andre was a normal child in a French village, he played football and rugby. It was only at the age of 15 he started to grow and grow. Later in his life it was discovered that he suffered from a disorder called acromegaly, which caused his gigantism. I know these were the days without the internet and Google. It does make you wonder that all those medics in wrestling and no one figured why this 7 foot plus person was still growing? However you get to hear more of Andre Roussimoff, from fellow wrestlers, his friends and more importantly his family that includes his daughter who he did not see often. Andre was a gentle man who could never run away from his size. A legendary drinker, actor Cary Elwes mentions it was to dull the pain in his joints. By the end of his career, he was in immense pain caused by his size. 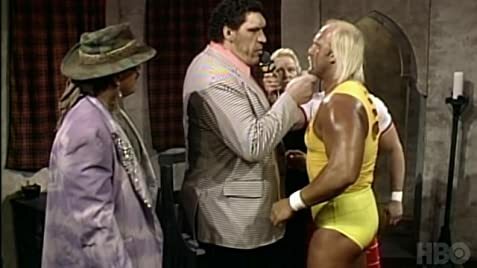 Andre the Giant is a look at a figure who bridged the gap when US wrestling moved to a new era but it feels superficial when you have scenes of Hulk Hogan in Rocky III. Vince McMahon announced this documentary in 2016. André the Giant: It's difficult everywhere I go. They don't build things for big people. They build everything for blind people, for crippled people, for some other people but not for big people. So we have to fit in there and it's not too easy all the time.